This harmonized set of soil parameter estimates for Central and Eastern Europe has been derived from a revised version of the 1:2.5M Soil and Terrain (SOTER) Database for Central and Eastern Europe (SOVEUR ver. 1.1) and the ISRIC-WISE soil profile database. 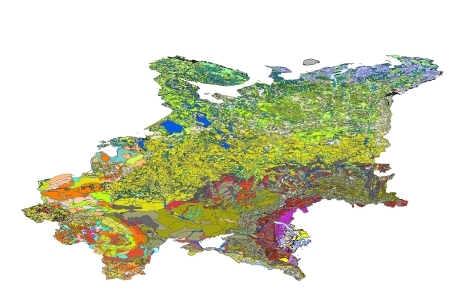 The land surface of Central and Eastern Europe, West of the Ural Mountains, has been characterized using 8361 unique ... map or SOTER units. The corresponding GIS files include some 9500 mapped polygons, including miscellaneous units. The major soils have been described using 662 profiles, selected by national soil experts as being representative for these units. The associated soil analytical data have been derived from soil survey reports. These sources seldom hold all the physical and chemical attributes ideally required by SOTER. Gaps in the measured soil profile data have been filled using a procedure that uses taxotransfer rules, based on about 9600 soil profiles held in the WISE database, complemented with expert-rules. The current parameter estimates should be seen as best estimates based on the current selection of soil profiles and data clustering procedure; taxotransfer rules have been flagged to provide an indication of the confidence in the derived data. Results are presented as summary files and can be linked to the 1:2.5M scale SOVEUR map in a GIS, through the unique SOTER-unit code. The secondary data are considered appropriate for studies at the continental scale (<1:2.5 million); correlation of soil analytical data should be done more rigorously when more detailed scientific work is considered. Batjes NH 2005. SOTER-based soil parameter estimates for Central and Eastern Europe (ver. 2.0). Report 2005/04, ISRIC - World Soil Information, Wageningen,. 3) Batjes NH 2003. A taxotransfer rule-based approach for filling gaps in measured soil data in primary SOTER databases (GEFSOC Project). Report 2003/03, ISRIC - World Soil Information, Wageningen. f9f23e4f-903a-4dfe-bfc4-0e6bf362b09a Access to the portal Read here the full details and access to the data.